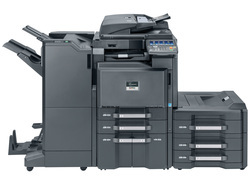 Multi-functional Devices.... document imaging innovation for your office. The CS 2551ci packs exceptional and intuitive functionality into a multifunctional system that is simple to operate and highly cost-effective. Your busy office will appreciate its high performance, offering solutions that can tackle day-to-day document imaging and workflow requirements with ease. Features such as bright business color and finishing options add impact when you need it, while helping reduce outsourcing costs. The MFX-C2700 is a compact color multifunctional printer (MFP) that combines printing, copying, scanning and faxing into a single, easy-to-use device. The MFX-C2700 is the perfect solution for small businesses, regional offices and corporate workgroups who would like to cost-effectively print and scan color documents from their desktop. The Copystar CS 306ci brings affordable color to document imaging, offering scalable features, output speeds up to 32 ppm and print, copy, scan and fax capability, all in a compact footprint. An intuitive 4.3" color TSI powers productivity with easy access to features and functionality, while a full suite of optional Business Applications takes productivity to new levels. ​Copystar CS 306ci is the smart choice for your evolving business needs. ​The Copystar CS 356ci brings new meaning to efficient business performance in a compact footprint. Flexible functionality streamlines document processes while business color gets your message seen, making the Copystar CS 356ci a powerful solution that can grow with your business needs. ​The Copystar CS 406ci brings new meaning to efficient business performance in a compact footprint. Exceptional functionality streamlines document processes while vivid business color gets your message seen, making the Copystar CS 406ci a powerful solution that can grow with your business needs. 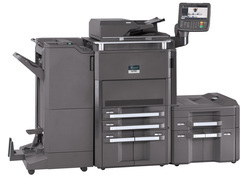 ​​Designed to impress, the Copystar CS 2552ci is the ultimate Color MFP for small business and distributed workgroups. As a flexible document processing hub, the Copystar CS 2552ci provides all the tools needed to easily and efficiently print, scan, and copy. Indeed, document processing is a breeze with a large tablet-like color touch screen, and intuitive feature selections that speed job turnaround. Whether running routine copies or scanning to a network folder, the Copystar CS 2552ci is the ideal solution for your growing business. ​The Copystar CS 3252ci puts Color and B&W imaging at your fingertips…taking your business to the next level. From a single device, effortlessly print, scan, and copy via the system’s intuitive, tablet-like color touch screen. As a flexible document processing hub, the versatile Copystar CS 3252ci incorporates a vast array of cutting-edge functionality to streamline document workflow and maximize office efficiency. Combined with Kyocera’s award-winning ultra-reliability, unique long-life technology and business application integration, the Copystar CS 3252ci is the ideal solution for growing businesses. The Copystar CS 3051ci delivers all the functionality needed to help maximize productivity, bringing flexible configuration and advanced finishing abilities for exceptional color and black & white output. Seamlessly integrated business applications power workflow. And, when combined with award-winning ultra-reliability and unique long-life technology, ensure superior performance and maximum efficiency. The Copystar CS 3551ci brings maximum productivity, plus exceptional color and black & white output to document imaging. Flexible configurations, advanced finishing and seamlessly integrated business applications power workflow. And, when combined with award-winning ultra-reliability and unique long-life technology, ensure superior performance and maximum efficiency. The speed and robust performance of the Copystar CS 4551ci helps your company easily tackle the most demanding document imaging needs. Vibrant color and exceptional black & white output combines with flexible product configurations and advanced finishing for professional output. Scalable, integrated business applications power document workflow, while award-winning ultra-reliability and unique long-life technology ensure superior performance and maximum efficiency. The Copystar CS 5551ci delivers the high quality functionality you need for maximum productivity. Vibrant image quality in both color and black & white, plus flexible configurations and advanced finishing handle both day-to-day document output and complex projects with ease, for finished pieces with a polished look. Integrated business applications streamline workflow, and combined with award-winning ultra-reliability and unique long-life technology, ensure superior performance and maximum efficiency. Designed specifically with the customer in mind, the Copystar CS 6551ci incorporates the flexibility to tackle both your day-to-day document imaging needs as well as more complex color projects with ease, through highly productive functionality and superior document handling. Robust finishing features and vibrant color technology bring the professional polish your output deserves, while integrated business applications provide added power and capabilities to transform your document workflow and simplify your business processes. Copystar's award-winning ultra-reliability and unique long-life technology ensure the superior performance and proven productivity your busy enterprise requires to keep it up and running at maximum efficiency. When it comes to document imaging innovation and quality you can count on, the CS 6551ci delivers. The Copystar CS 7551ci incorporates the flexibility to tackle both your day-to-day document imaging needs as well as more complex color projects with ease, through highly productive functionality and superior document handling. Robust finishing features and vibrant color technology bring the professional polish your output deserves, while integrated business applications provide added power and capabilities to transform your document workflow and simplify your business processes. Copystar's award-winning ultra-reliability and unique long-life technology ensure the superior performance and proven productivity your busy enterprise requires to keep it up and running at maximum efficiency. When it comes to document imaging innovation and quality you can count on, the CS 7551ci delivers.